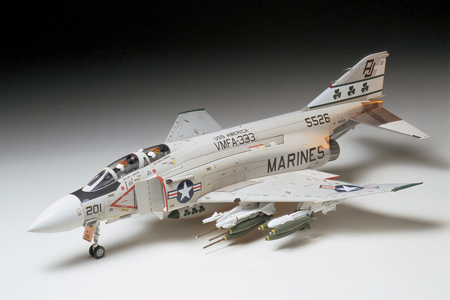 TAMIYA 60308 MCDONNELL DOUGLAS F4J PHANTOM 2 MARINE (1/32) scale model kit! 1:32 scale. Measures 22″ long with a wingspan of 14 1/2″ when complete. This giant kit features: amazing exterior and cockpit detailing, detailed landing gear with doors, die-cast metal landing gear strut, solid synthetic rubber tires, many weapons included: Mk.82 LDGP, Mk.82 LDGP with extended fuse, AIM-9E Sidewinder, and AIM-7 Sparrow. The kit also comes with an arresting hook, realistic plastic pilot figures, Open or closed cockpit canopy, a 600 gallon drop tank, highly detailed ejection seat, and an in-flight refueling probe. Comes with markings for three aircraft- MARINES, USS AMERICA VMFA-333, w/Shamrocks, USS ROOSEVELT NAVY, VF-84, Jolly Rogers w/Skull & Cross Bones, and MARINES, VMFA-232, First to Fight Devil Insignia. Skill level 3.